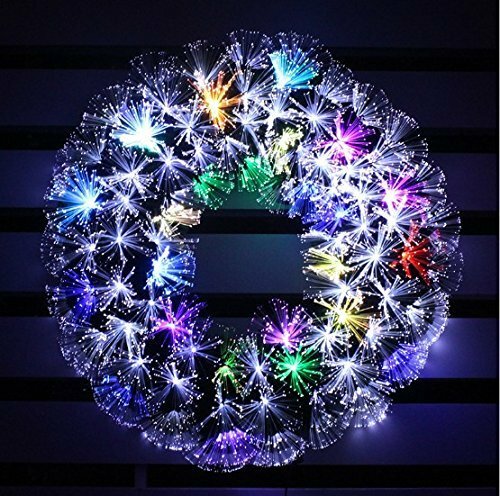 This traditional style wreath fitted with warm white LED lights will add a special touch to any doorway or window this holiday season. Designed and produced by Holiday Stuff Company. Light weight, easy to hang and fit everywhere. The first time you assemble this wreath may require the most shaping. In future seasons, the effort you put into mastering the shape of the wreath will help you become an experienced shaper. In time, this beauty will also retain much of the shape from the previous season, you sure will love to putting it up every year. High quality and good technology give this wreath at least 10 years of use. Eco-Friendly green PVC tips fitted with fiber optic, every tips is a individual LED light. Multi color, latest color changing technology, capture the image of firework exploded on every tips. White color light stays on, 7 colors continuing change from one to anotherHigh quality fiber optic and LED light, energy-efficient. Upgraded Worry-Free LED light. At lease of 10-20 years of use. Design and produced by Holiday Stuff Company. Light weight, indoor outdoor use, eye-catching decoration that requires minimum effort to set up.Oreder before 5pm for same day shipping!Shipping services: 3-7 business days delivery guarantee from the day of purchase, we refund your shipping charges if the shipment was late! If you have any questions about this product by HOLIDAY STUFF, contact us by completing and submitting the form below. If you are looking for a specif part number, please include it with your message.